This is mostly likely a pop cultural reference that only those in North America really get (sorry, everyone else) but with the retirement of late night television show host David Letterman, there has been a lot of news about his Top Ten lists. When a newsletter from another Dave (Cormier) entered my email box, asking us to think and maybe contribute to the development of a practical guide for engaging in Rhizomatic Learning, my sarcasm box got powered up. 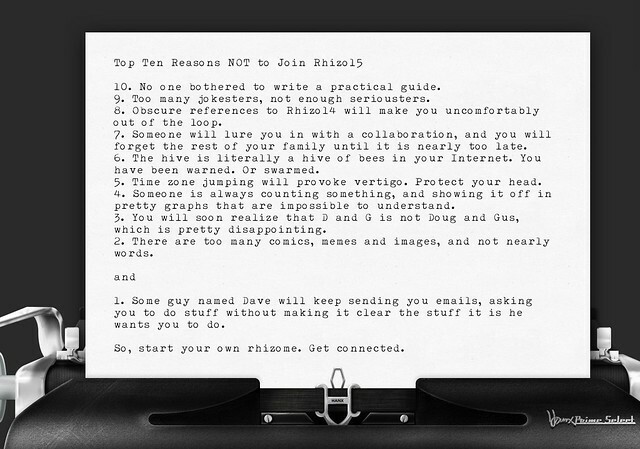 By the way, I used the Hanx writing app, which gives you that old-fashioned typewriter feel to writing. I like the look of it for a top ten list. 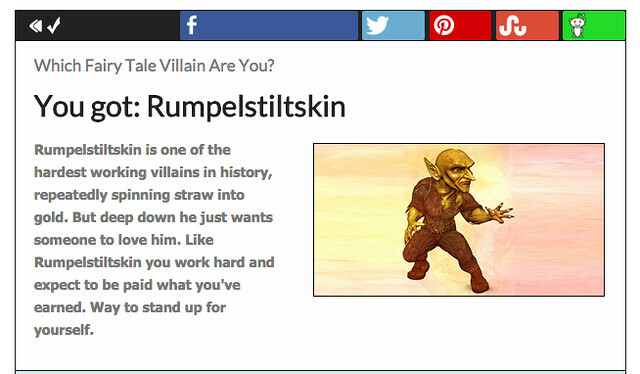 I took this quiz after read this post by Ellie in the Rhizomatic Learning network and I know it’s determination of me as that ugly child-stealing, gold-weaving villain is not worth a hill of beans (or maybe a mountain of straw?). But the post by Ellie is still interesting as a conceptual device, as she wonders aloud about how we can map ourselves to fairy tales. Fairy tales are such archetypal stories, right? It has me wondering if Disney hasn’t spoiled this notion for so many of us, with its sugar-coated, Captain-Crunched recasting of Grimm Brothers’ stories of old, which were very scary and not always happily-ended, and often tended to resolve themselves on the fortitude and wits of the heroes and protagonists, not on the kindness of strangers. I don’t know what fairy tale I would map my own life to in a way that makes sense (that would be a messy adventure), but the fairy tale character generator that put me as a villain like Rump is intriguing in itself. Spinning gold from straw? Blog posts from ideas? Stories from thin air? Poems from a single word? I wouldn’t go about stealing your baby, but I might remix it a bit, changing the nature of your creative offspring to make it something new and interesting, and then, unlike Rump, I give it back to you, too. You don’t even need to speak my name to dispel the magic, and I won’t be dancing around a fire night at midnight, gloating over my plans. Can We Understand Without Understanding? I’ll be the first to admit that I don’t quite understand the theoretical or philosophical underpinnings of Rhizomatic Learning, with its grounding in the work of Deleuze and Guattari. Whenever folks in the #rhizo15 community start to reference D&G, my mind sort of begins to wander. I’ve tried to read some of D&G over time, and even enjoyed this artist’s rendition of the first few chapters of A Thousand Plateaus. Tried and got bored. Or lost. I found this quote, which seems to be a guiding anchor as to why we are even connected D&G to learning ideas in a world in which technology is altering how we read and write and connect and publish and think and network. 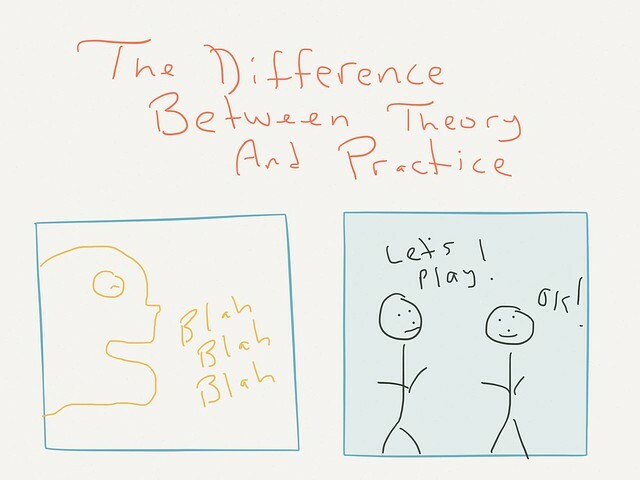 But, to be honest, I’ve been more attuned to Dave Cormier’s condensed idea of Rhizomatic Learning in terms of the classroom or network as an ecosystem where ideas spread through shared practice and knowledge, each node connecting to another in a way to help make everyone move ahead in their knowledge and understanding. 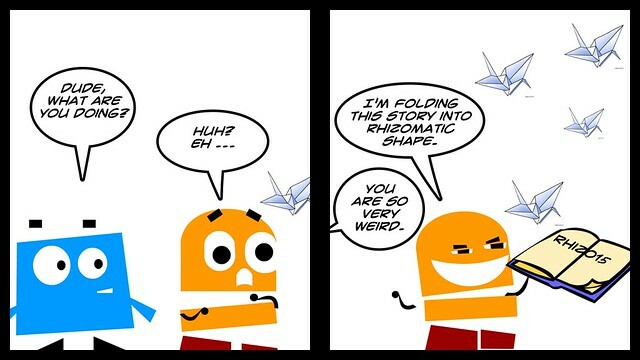 Or that is my own interpretation of Dave’s interpretation of Rhizomatic Learning. It all dovetails with Connected Learning principles, in a way. My question for myself is, do I have to fully understand D&G in order to be part of the #rhizo15 experience? Am I just a faker on the outside, tossing comics into the mix like pebbles in the pond? Do I need to be “in” to engage? Will I need to spend a few hours with D&G to feel authentic and valued? 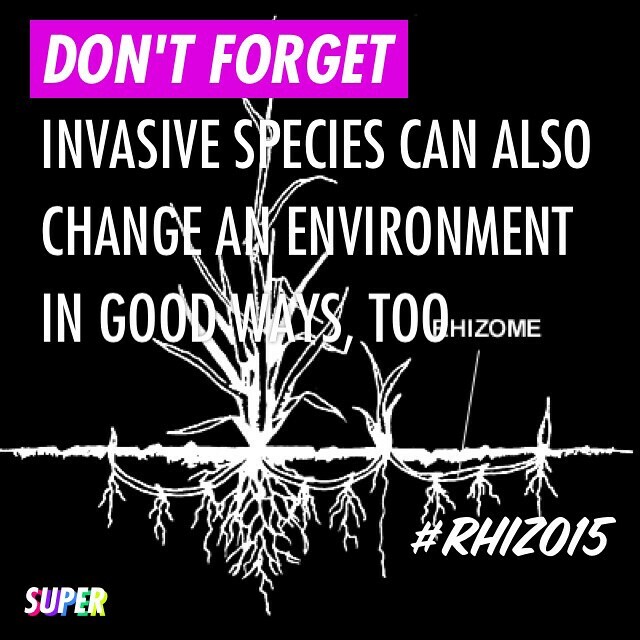 I think the #rhizo15 course, so to speak, has been designed by Dave to be open enough that anyone can experience Rhizomatic Learning on their own level, and still be welcomed into the fold. Dave might have certain ideas that spur his own questions to us, but he has never made anyone beholden to the concepts of D&G. Terry ripped into D&G this weekend, sparking a lot of discussion at his blog site about the use of imprecise language by D&G, and the over-interpretation of theory instead of practice. I like that anyone can freely question the entire architecture of an idea and still be part of the community that grapples with the idea. I took phrases from the collaborative exquisite corpse story, ala Rhizomatic Learning, and used the Language is a Virus Visual Poetry site, to “draw” a garden of ideas. It’s not as good as I had in mind, but it works to represent the idea of pieces of the story coming together to “grow” a collective story. It might just be that it is cool to look at. So, this was interesting .. I set up a Fold that Story collaboration within the Rhizomatic Learning community and invited folks to write within the Exquisite Corpse structure — you only see the fold above you and nothing else — and the next person only sees the fold you left, and nothing else. Yeah, the story unfolds in strange tangents, as different writers take the story in different directions. Interestingly, there are common threads that hold it all together over the course of the 20 folded story strands, and that is no doubt a reflection of common discussion themes in the Rhizo15 community. PS — Curious about who wrote what? Here is a link to a version that has names attached. Warning: This is one of those posts where I don’t have any clear ideas of where I am going to end up. I am thinking as I am writing. 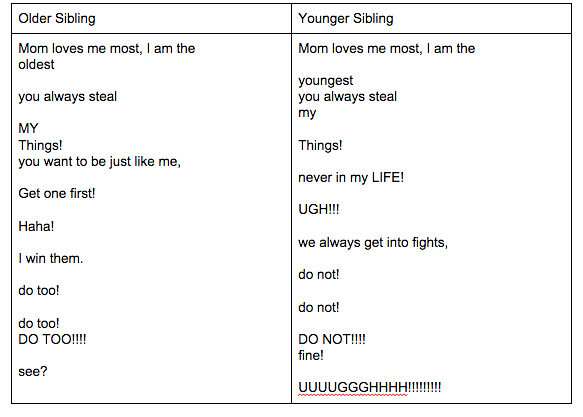 Writing as I am thinking. “Anybody know how to …” a voice called out in the classroom. I watched from another part of the classroom, as one student got up from their project, walked over and showed another how to add the loop browser into Garageband. “How do I ….” another student called out. I’m thinking of all of the work going on in the Rhizomatic Learning community these past few weeks, right into this week’s current theme, as posed by Dave Cormier, of “rhizomatic learning as an invasive species.” I’ve appreciated Terry Elliott continuing to remind us to find and notice and share out rhizomatic practices in the field, to help make the move from the theory of the tangled roots of learning to what it might look like in the classroom. So, these “poems for two voices”? They are a tangled woven root system in themselves. Designed to be read and performed, the poet weaves the words in and out of the two voices, often pulling phrases into conflict and then in harmony with each other. Ideally, the two topics are related but different enough to create tension. 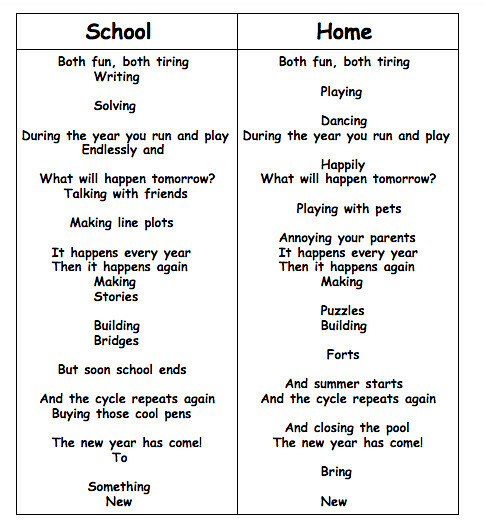 For 11 and 12 year olds, even at the end of our sixth grade, writing “poems for two voices” is critical thinking challenge, and not only in the crafting of the words. The physical writing, of leaving gaps in the poem for the other voice to fill, required me to teach them how to make and use tables. That seems pretty basic, no doubt, but if you have never created a table before or used a table before in a word document, it’s something new to be discovered. Add the element of podcasting, and a new software experience (Garageband), and suddenly, the level of learning gets extended even further, and this is where (as indicated by some of the exchanges above) that I noticed what rhizomatic learning sort of looks like in small moments of my classroom. I have purposely tried only to show my students the basics of Garageband, and given them time to play and tinker before moving into the recording of their performance of the “poems for two voices.” Sure, it would have been easier and simpler to use some other voice recording tool, or to have given detailed Garageband instructions. But it is a wondrous thing to watch what happens when everyone is struggling to get their head around how to add new tracks, record different voices, add vocal effects, and layer in a musical loop soundtrack underneath the poems, and to observe what happens if the teacher is purposely (they don’t know this) standing back, offering only minimal support. They help each other. They turn to others. They play and figure things out, and then share that knowledge in a very informal way. One helps another. That person helps another. Someone discovers something “cool” and a crowd flocks around to learn how to do it, too, and then that leads to something else, and suddenly, the classroom is alive with experimentation. 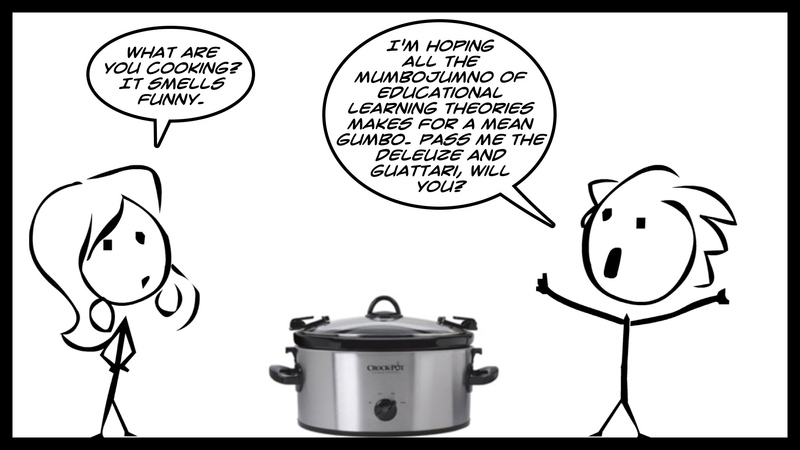 Or, learning. I am always surprised, and saddened, when so many students say they “hate writing poems” and it is mostly a result of being forced to write in strict styles, particularly rhyming poems, that don’t allow students to feel free and experiment with language. 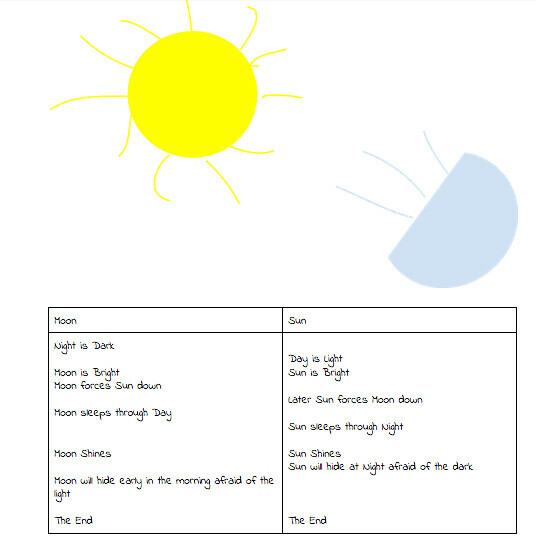 This “poem for two voices” (and we even read together a very complicated “poem for four voices” that blew their minds) is so unlike anything that they have experienced, that it opens up new possibilities for how we merge writing and technology and creativity together. What’s my role in this podcast activity, as teacher? Of course, I am there to help those students who just can’t seem to figure it out, for whatever reason. I guide them. I call over others. And my role is to put the experience into a context of learning, of helping them see the entire process from above after spending time deep in their little recording world. My co-teacher and I were having a conversation in class yesterday, as we watched this unfolding. We were talking about changes in expectations this year with a new principal and her push to make the standards we are teaching more explicit and preferably posted each day (we are not yet required to do that but I suspect it is coming), and how some teachers are struggling to figure out how to find that balance between their experience in knowing what engages students as learners and offering proof that it connects to standards. We looked around the room, as podcasts were being recorded, with students in headphones speaking into computers and remixing media. There was laughter, and sharing, and teams working. I noted that while the learning on display here touched on writing and speaking standards, my main goal was to enrich their knowledge of technology and keep the push alive to get them composing their own content, making the shift away from passive consumer. There’s no explicit standard for that. I know the phrase of “invasive species” has a negative connotation (something foreign snuffing out the native species), but if we think in the positive of learning something new and sharing it with others as a way to create impact, and maybe root out some shared knowledge, by suffocating old ideas, then this kind of media poetry activity is on target. My latest blog post over at Middleweb explores how to talk about race, and how difficult it can be with sixth graders. It was all sparked by a unexpected question by a student, who asked why some people can use the “n word” but others can’t. Check out my post, as I stumbled through that terrain. 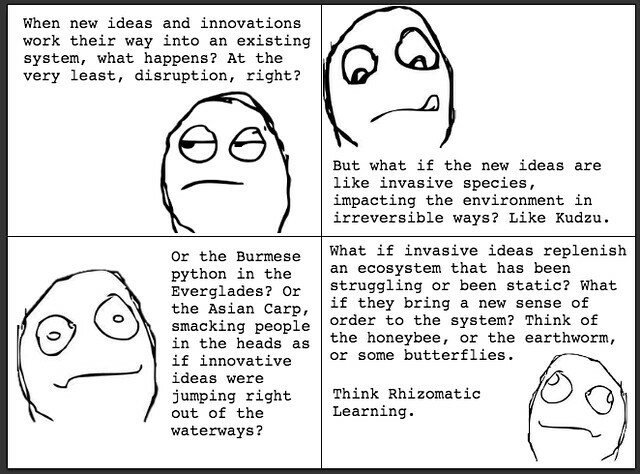 Dave pulls out the metaphor of “invasive species” for the latest round of thinking in Rhizomatic Learning. This has a few dimensions to it, and I will be thinking about this a bit more as we move forward into week. My first impulse was that invasive species are bad. Then, I thought, but not always. The question, on this level, is: How does a rhizomatic concept of learning replicate a positive invasive component, squirreling its way into the core of what we consider learning to be? We all thought Zeega was dead, but I guess not. You can still make media projects, so I took the final version of a collaborative recording — The Rhizomatic Blues — and popped it into Zeega to create a little media version of the song. The song was completely recorded collaboratively and remotely, using Soundtrap.